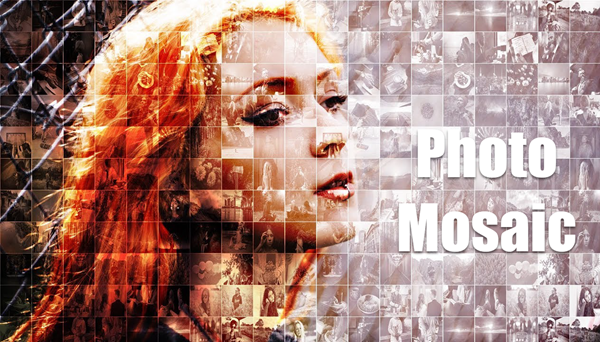 What is Photo Mosaic? It is a photo that is made from the assembling of many small pieces of images. Seen from a distance, the smaller photos make a big photo; and when seen close at hand, the smaller pictures come into sight distinctly. It is like a digital trend followed by many to create photo mosaic. Undisputedly photo mosaic is the most striking effect that can be added to both photos and videos. MozoDojo is a professional photo mosaic software for creating mosaic by using iTunes library, iPhoto library, and your pictures folder. It can make a beautiful mosaic made up of hundred or even thousand of images. The larger your picture library, the better the results you can get. You can select as many images as you can, and you will be more creative with that. It also has many techniques like image mirroring, tinting, lightning models. MozoDojo is extremely simple to use – just drag and drop an image into the main interface, or browse it from the file menu. By the way, his software also provides high resolution mosaic. 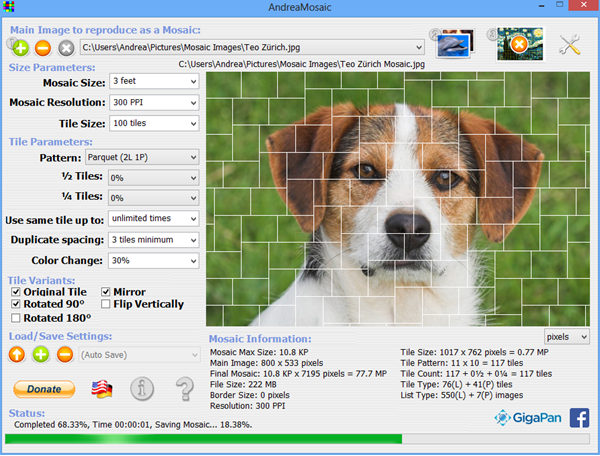 With AndreaMosaic you can create your own photographic mosaic made with the pictures you prefer. You can set parameters like width (2000, 4000, 8000 pixels), algorithms, number of tiles per row, minimum distance between duplicated tiles and many more. This software can be free even for commercial purpose, which means you do not need to spend anything for this. However, it also has professional and standard versions, with features like high resolution, automatic adjustment of color and brightness, automated image cropping, on-the-fly creation that meet your various needs. 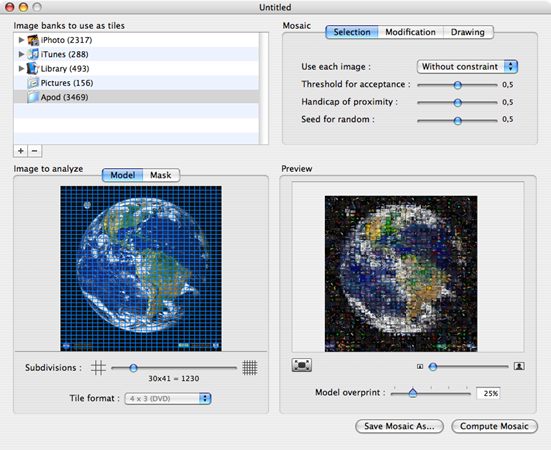 Imosaic is a free photo mosaic software for multiple platforms. It permits you to create database of images and then makes photo mosaics. You can even use it to create 3D photo mosaic screensaver. There is also ImosaicWeb which helps in creating photo mosaic using database of categorized images. This is the best photo mosaic maker available for Windows and Mac computer. You can download it as a free trial for your computer, and then you will be given the opportunity to watch a tutorial. Anyway, the pro edition enables you to create mosaic photos for personal and business use. You will have a lot of fun playing around with a lots of its settings. After you ave had all the settings how you wanted them, this photo mosaic maker then generates your photo mosaic in only a few minutes. 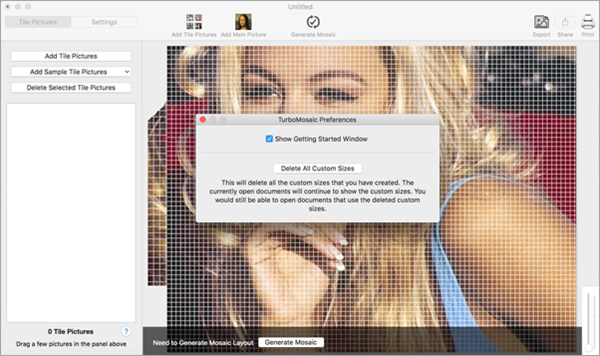 If you are in the market for a best photo mosaic software, Turbomosaic will be a solid choice. I think Filmora Video Editor is the most highly recommend and useful mosaic software. As its name suggests, it is a video editor, but it is powerful enough for you to design mosaic in videos, as well as photos. It has a unique user-friendly interface. 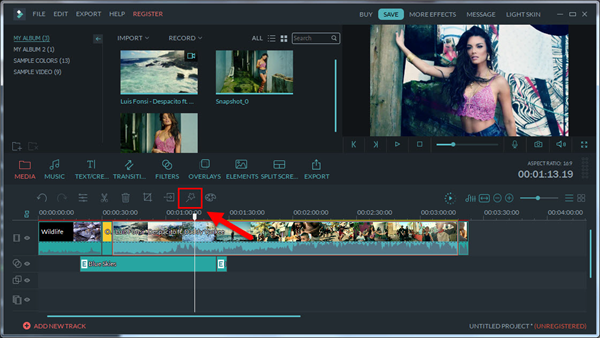 You can drag and drop your media file to its timeline and then the sequence of the clips can be edited and rearranged very easily and smoothly. And you can also see the video preview after editing which makes it more smarter. It has many transitions and special effects like mosaic, split screen, green screen and etc. Here we will use Filmora as an example and show you how to design and make photo mosaic. Let’s take a look at it. Simply drag and drop your video to the timeline in the program. Another way is that you can click on the “+” icon and then select “Import Media File Here”. Click on the “power tool” icon on the main interface. You will see a pop up window, now click on the “mosaic icon”. You can choose more mosaic styles by clicking on the “add button” on the side menu and then you can apply them as per your wish. Blur the entire photo and select the percentage of blurring as per your wish. And yes, you can also select the specific areas which you want to blur. Editing options and transitions are also available to make mosaic more creative which can be used by you for far more better effects. You have the option to preview and then saving the file in your desired location and format and also sharing the file on YouTube by clicking the “export button”. For the photos including annoying tourists, watermarks or texts, you will need this Photo Eraser to help you remove unwanted objects from photos without Photoshop. Just download and try it for free. In this article we have provided you with some best photo mosaic softwares likeMozoDojo, AndreaMosaic, Imosaic, MacZaic and Filmora Video Editor. You can try to make amazing and artistic mosaics with them. We suggested you the best photo mosaic software as per you need and these photo mosaic software will definitely going to help you by creating interesting and beautiful mosaics. You can also learn how to create photo mosaic or video mosaic step by step in this article. Now follow the popular trend of making mosaics just like digital artists.